U.S. Ambassador to the United Nations Nikki Haley said Monday that North Korean leader Kim Jong Un is “begging for war,” and warned that the United States does not have unlimited patience. Haley spoke at an emergency meeting of the U.N. Security Council called after North Korea conducted its sixth nuclear test on Sunday. Pyongyang claimed it successfully tested a hydrogen bomb that can fit onto an intercontinental ballistic missile (ICBM). International experts have not confirmed that, but say it was larger than any previous North Korean nuclear test. "The time has come to exhaust all diplomatic means to end this crisis; that means quickly enacting the strongest possible measures here in the Security Council," Haley said. Haley said the United States would be circulating a new draft sanctions resolution for the council to negotiate this week and that she hopes to put it to a vote next Monday. One week would be a very quick turnaround for such a resolution; previous ones have taken between one and three months of negotiations primarily between the United States and China to agree to new sanctions. Both the South Korean and Japanese envoys, as well as several council members, echoed the U.S. call for strong, robust international sanctions. Haley also dismissed a Chinese initiative calling on North Korea to freeze its nuclear activity in exchange for the United States and South Korea freezing their annual joint military exercises in the region. The ‘freeze for freeze’ as it is known, would be implemented to establish an environment conducive to talks to resolve the nuclear issue. China is North Korea’s neighbor and closest ally. Chinese U.N. envoy Liu Jieyi condemned North Korea’s actions and called for them to stop, but he also reiterated the Chinese position that there is no military solution to the crisis. “China will never allow chaos and war on the peninsula,” he said. “There is no doubt that presently we are experiencing one of the gravest and most dramatic stages of developments on the Korean Peninsula,” said Russian envoy Vassily Nebenzi. “It is no exaggeration to state that peace in the region is in serious jeopardy and the threat of this conflict morphing into a hot stage looms larger than ever before,” he added. He urged parties “to maintain a cool head” and refrain from any action that could further escalate tensions. Earlier Monday, South Korea's Defense Ministry said it had detected signs North Korea was preparing to test another ballistic missile or possibly an ICBM. The ministry also announced plans to temporarily deploy four more launchers for the THAAD missile defense system. Monday’s meeting was the second time in less than a week the Security Council convened to discuss North Korean nuclear and ballistic missile activity. 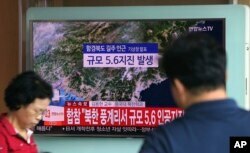 Pyongyang launched a missile that flew over Japan early last week, prompting strong censure from the 15-nation council. On August 5, the council unanimously adopted the strongest package of sanctions so far against North Korea, including bans on its coal, lead, iron and seafood exports. Diplomats are running out of sectors to target for sanctions. Oil is the country’s most important sector, while textile manufacturing is also an important revenue generator. The council could also look at designating new individuals and entities for asset freezes and travel bans.